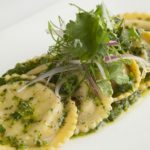 Coleslaw with jicama Mexican-style: What is the difference between ‘coleslaw’ and ‘slaw’? The British use the word coleslaw to describe a shredded cabbage salad with mayonnaise dressing. It seems that the Americans use the word ‘slaw’ to describe pretty much the same thing with just one difference. Often we find that the slaw we have been served have contained no mayonnaise but this may simply be a coincidence. 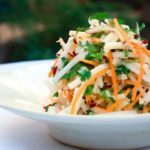 The word coleslaw comes from the Dutch word for cabbage salad, ‘koolsla‘, where ‘kool‘ means cabbage and ‘sla‘ means salad. As the Dutch entered New York in the early eighteenth century, they bought with them many recipes one of which was their chilled cabbage salad. 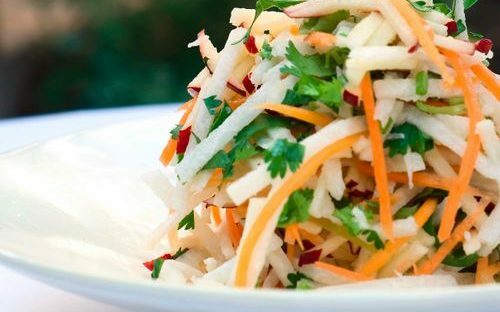 Slaws are sweet or savoury, chilled or warm but at the heart of every slaw is a crunchy shredded cabbage. Generally your coleslaw will withstand storage in the fridge for a few days without turning into a limp and soggy mess. 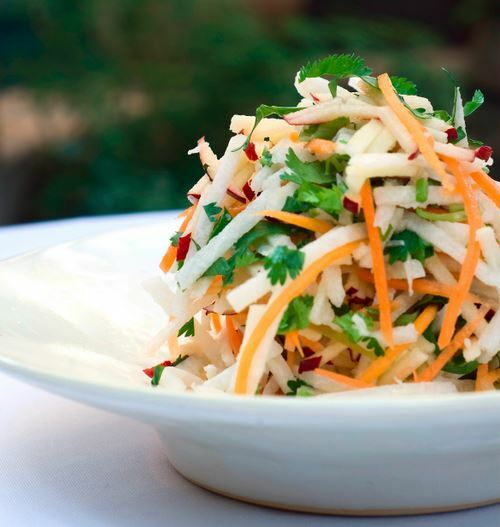 Today, the variety of coleslaw or slaw available are testiment to their continued popularity as we evolve new recipes. So without further ado, let’s pass on our recipe for Mexican-style coleslaw. In a large bowl, whisk together the olive oil, orange juice, lime juice, zests, garlic, cumin, salt and pepper. Add the rest of the ingredients and toss to combine well. Cover and chill for up to 4 hours before serving.